RRC South Eastern Railway (Bhubaneswar) Group ‘D’ Exam of the year 2014 held on dated 2 November, 2014. We are giving 70 questions of Maths and Reasoning of this exam with answers. mother-in-law’ How is Vipin related to that girl ? son”. How is Amal related to that lady? 21, 23, 27, 33, ? 68, 67, 64, 59, ? Directions (8-9) : Choose the missing term out of the given alter-natives. 8. A, C, F, J, ? 9. A, Z, D, Y, G, X, ?, ? 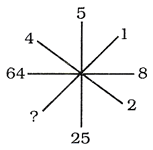 21 » 8 + 2 – 12 × 3 = ? the ratio becomes 4 : 5. Find the difference between the numbers. 18. The side of a cube measures 9 cm. What will be the diagonal of the cube ? 20. The curved surface area of a right circular cone of radius 14 em is 440 sq. cm. What is the slant height of the cone? 22. Find the missing term. 30. 20% of 10000 = ? 31. A table is bought for Rs. 950 and sold at Rs. 40, find the gain percent. 39. (a + b)2/ (a2 – b2) = ? 43. How much simple interest will Rs. 2,000 earn in 18 months at 6% per annum ? the area of the field. 45. Which is not a prime number ? 49. The difference between 78% of a number and 59% of the same number is 323. What is 62% of that number? this word as the words of the given pair bear. 51. Eye : Myopia : : Teeth : ? 52. Moon : Satellite : : Earth : ? 54. Magazine : Editor : : Drama : ? Physics and History. Nisha and Anjali are good in Physics and Mathematics. Poonam and Shobha are good in History and Dramatics. 56. Who is good in Physics, History and Dramatics ? 57. Who is good in History, Physics, Computer Science and Mathematics ? Directions (59-60) : Find the odd one that does not belong to the group. number which is similar to the numbers in the given set. 65. Find the odd one that does not belong to the group. 1800 in the clockwise direction. Which direction is he facing now? 1350 in the anticlockwise direction. Which direction is he facing now? I : All moons are planets. II : All planets are stars. (a) Only conclusion I follows. (b) Only conclusion II follows. I : All men are cats. II : All cats are men.